Steel is produced in many different forms including plate, thinner sheet, bars, pipes and tubes, wires, and rails. It is then used to make a multitude of items from aircraft to steel posts and even paper clips. But the type of steel used to manufacture an aeroplane or helicopter is not the same as that used to make a steel post. In addition, the end use of any steel post will determine the dimensions and strength properties required. There are a host of different Australian standards that might apply to steel posts. Some relate to manufacture, others to installation, and others apply to finishes including galvanising. Ultimately, it depends largely on the function the steel post will fulfil. While there are 2,584 Australian and ISO (produced by the Swiss International Organisation for Standardisation) standards that relate to steel and steel products produced in Australia, only a few relate specifically to steel posts and poles. And there is a large difference between one type of steel post and another. AS/NZS 1163: 2016 Cold-formed structural steel hollow sections that covers three strength grades that are suitable for welding. BlueScope extra-light, light, medium, heavy, and extra-heavy pipes are made in accordance with this standard and are available in grades C350L0 and GRD350. Square and rectangular hollow sections and cattle rails are also made in accordance with this standard. AS/NZS 3679.1: 2010 Structural steel Hot-rolled bars and sections that specifies the requirements for production and supply of bars and sections for general structural and engineering use. BlueScope flat mild steel, angles, billets, round mild steel, universal beams and columns, welded beams and columns, and several other products are made in accordance with this standard. AS/NZS 1594: 2002 (R2016) Hot-rolled steel flat products that specifies how hot-rolled steel plate, floorplate, sheet and strip steel, that is rolled on a continuous mill should be produced. AS/NZS 4677-2010 Steel utility services poles relates specifically to poles that are used for street lights, floodlights, traffic signals, communication equipment, aerial conductors, electromotive-transport conductors, and similar utility service poles. It does not apply to masts or flag poles. A benchmark for excellence, it is applicable specifically to structural steelwork rather than a simple fence post, although there are specifications that are relevant, particularly in relation to preventing corrosion. There are also numerous standards that relate to welding of structural steel and specific types of structures, as well as those that specify paints for steel structures, and colour coding of steel products. AS/NZS 4792 Hot-dip galvanized (zinc) coatings on ferrous hollow sections, applied by a continuous or a specialized process specifies standards for pre-galvanized tube. Within this standard are a number of options regarding grades, and the Australasian Wire Industry Association advises that AS/NZS 4792 HDG300 galvanised posts will last three times longer than pre-galvanised posts treated in accordance with AS/NZS 4792 ZB100. BlueScope Distribution manufactures roll top and bottom fencing options in a couple of different styles, both of which may be either galvanized or powder coated for a more decorative finish. While the fencing material may be fixed to timber posts, more popular options are square steel sections or steel pipe posts. 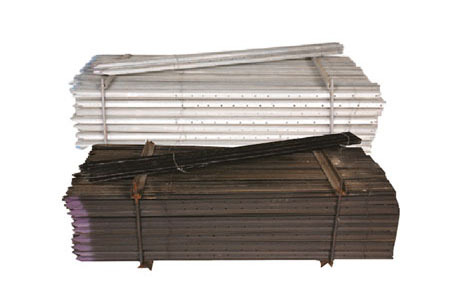 Both types of steel post are ideal for use as a fencing post. A steel post for fencing and barbed wire fences, available from BlueScope, may be black or galvanised. These are supplied with 8 mm holes punched to accommodate the wires. BlueScope also specialises in rural products for farmers including panels, yards, and gates that are supplied in frames. These also incorporate a fence post of some sort. There is also a fiberglass fence post available in two sizes from BlueScope Distribution – 1 m and 1.5 m – for electric fencing. Accessories for electric fencing include both steel fence post and wood fence post insulators. Whether you require structural steel for a construction project or a steel fence, steel post, or steel gate for your home or rural property, BlueScope Distribution is ready to help meet your needs. Call us today.